It’s autumn time, and what better way to embrace the cosier season than with a bit of crochet? These patterns will prove super easy and fun, ensuring that you’re able to spruce up your home, or give a gift to a dear friend or little one in no time. A new season calls for a bit of DIY, and although the nights have begun to draw in you still won’t have to sacrifice on colour! In fact, revamping your sofa with these granny square cushions is sure to brighten your mood. Designer Susie Johns shows us two different ideas for making a granny square cushion, both of which are easy to get stuck into. The blue pattern features one large square, while the coral project comprises nine smaller shapes sewn together. A new blanket is just what you need to add a stylish touch to the bedroom. Emma Varnam’s project can be worked quite quickly, and will allow you to clear out your stash oddments. Use your completed make to keep you warm on cooler nights or as a decorative piece in your home. Make your bedroom into a crochet haven by creating a cover for your lamp. This pattern uses simple granny squares, giving newbies the opportunity to hone their skills, and once it’s completed, you’ll be able to create additional lampshades to dot around the home. What’s even better is that the lampshade will create a beautiful glow once the sun has set, giving your room a cosy feel. Update your look with a classic headband that’s very simple to make. Helen Ardley uses pretty flowers as embellishments for that extra bit of detail and to keep thoughts of spring close by. You’ll also keep your ears snug when the cooler weather sets in. Keep your tables stylish and safe with these pretty coasters. The floral patterns will create an inviting, sun-inspired vibe, leaving your home feeling brighter and more beautiful than before. They are fun to whip up and make great gifts for friends and family. You can follow the colour combinations as seen in the photo, or swap a few out to match your living space. Your autumn celebrations will require some thought and colour, but starting off with the décor is a sure way to get ahead. A party is never complete without some bunting hung in a garden or throughout the home. Use vibrant yarn and a few basic stitches to create the perfect pattern and watch your celebrations come to life. If you’re looking to take your crochet skills to the next level, this may be the perfect project for you. Irene Strange’s beautiful rainbow hedgehog is the ultimate pattern to create a gift fit for a little one. The top section is made in two stages; first crochet the white lattice base, then make stripes of bobbles on the wrong side of the work before pushing the spines through to the right side. This takes a bit of patience but gets easier the more rows you work. A classic game is all you’ll need to keep children entertained on the weekend, or when you’ve got a long journey ahead. This roll-up game is the perfect toy, and can be easily stored! If you remember playing Noughts and Crosses as a kid, then you’ll know that these bright, crocheted pieces will turn dull notepaper into a tactile and fun experience. The amigurumi craze has doubled amongst crocheters in recent years, and what could be a better way to join in on this popular activity than making this michievous monkey? Your child will spend hours on end playing with their favourite stuffed friend, and it will become their cuddle buddy once night time sets in. Worked in separate pieces, it won’t take long to sew together. Keep a child’s focus on any camera with the use of this crochet lens toy. No longer will it take you a lengthy time to get the perfect family photo. Christine Buddy’s quirky design slips over the lens of an SLR camera and is kept in place with an elastic hairband, making it quick, easy and fun. If you’ve got kids who have dreams of being a part of Cirque du Soleil, then why not make these juggling balls for them? They balls are lightweight and will fit almost anywhere, making them super easy to take on any journey. This pattern uses simple increases and decreases to create a clever make and you can adapt the colours to suit your personal taste. Fancy making these two gentle giants? 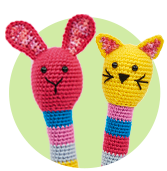 Irene Strange has made two toys, which feature pretty circular granny designs on the back, fun stripy ears and adorable mini tusks. There are just four easy stitches to master, meaning you can create a pair quickly. They’d go well among little one’s toys, or can be used for display purposes. Whatever you choose, you’ll be sure to have oodles of fun making them! 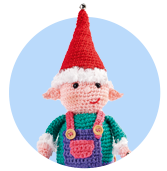 Make a kid’s dream come true with these crochet fairy tale characters. Featuring Red Riding Hood, Cinderella and Rapunzel, Irene Strange uses a simple amigurumi pattern to customise each. You can even add further details for a bit more creativity. There are only five basic stitches to master and no fiddly seams to sew up, so these projects are great for crochet beginners wishing to expand their repertoire. Bring the beauty of autumn into your home with these colourful decorations by Emma Varnam, which can be used as coasters or added to your wall art. This pattern will teach you how to do surface slip stitch, where the stitches are worked through the fabric of your piece. If you find it fiddly, you can create the details of the leaves with a chain stitch.